Japanese cuisine has many different types of salads, but one of the most traditional is known as sunomono, which is a salad simply seasoned with rice vinegar, salt, and sugar. While the salad can be made with almost any type of vegetable, one of the most common ingredients is cucumber. 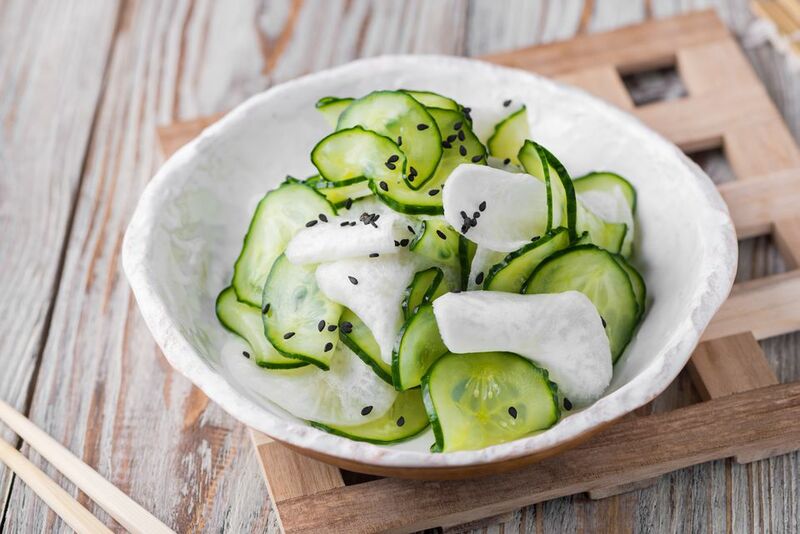 In general, sunomono is best made with Japanese cucumber; however, substitutions may include Persian cucumber, baby cucumbers or English cucumbers. Put cucumber and daikon slices in a large bowl and sprinkle with salt. Allow the vegetables to sweat for about 5 to 10 minutes. You'll notice excess liquid form at the bottom of the bowl. Wash off the daikon and cucumber slices, then drain through a strainer. Lightly squeeze the vegetables to remove any excess liquid and put into a clean bowl. In a separate small bowl, mix rice vinegar and sugar together until incorporated well. Pour the vinegar mixture over the cucumber and daikon slices. Allow the flavors to meld by setting aside for about 15 minutes. Spoon into individual dishes or a large bowl and serve. Alternatively, chill the salad for 30 minutes or until cold. This recipe for spicy, tangy and sweet daikon and cucumber sunomono salad is quite traditional since Japanese daikon radish is often used in sunomono as the main ingredient. While sunomono may be served immediately, it's best to chill it first for a very refreshing dish. This recipe may be made ahead, up to a day before, and chilled in the refrigerator until ready to serve.